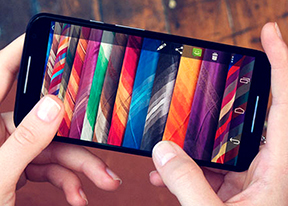 The gallery in Android 4.4.4 KitKat is called Photos. Upon opening the app you'll see two tabs - Camera and Highlights. Above those two tabs you get the Movie, Search and Settings shortcuts. The Camera is a grid of your photos and videos, three on a line. The very first thumb is marked as Folders and will return you a step back to the old Album view, where you can choose to open a different album. The Gallery will always open the Camera album by default. The new Gallery has a few hidden goodies that we almost missed. There is a hidden navigation menu pane that is revealed with a swipe from the edge of the screen anywhere in the gallery. You can easily switch Google+ accounts from there, go to Albums, Videos, Photos you are tagged in, all Google+ photos or even the deleted photos. There is also an Auto Awesome section. It is something like a smart gallery that combines similar photos and videos in a cool way - it either exports a collage picture or a motion gif. If you like the combination the gallery has made for you, there is a dedicated shortcut to save the new picture in the gallery. The old gallery is also on board. The Default view of the gallery is Albums, the first of which is always the Camera album, which has a camera overlay icon too. Rather than the familiar stacks, the app uses a grid of photos, two on a line. A handy option is the Make available offline feature - it lets you easily select multiple online albums and download them for offline viewing. The Gallery app supports online albums from Google+ and Picasa and sync is available just like in the new Photos app. You can make all of the albums available offline. The settings menu lets you do simple edits to a photo (rotate, crop) or go into a more capable editor with a lot more option. The editor can be accessed from a small icon from the bottom left hand-side corner and offers light adjustments (so you can bring out the shadows or the highlights), effects, color styles, red eye correction, straightening a photo, sharpening and face glow (which detects faces automatically). Most of these options have a slider that lets you fine-tune the strength of the effect. The video player has retained its stock Android interface. Like last year, Motorola has added much better codec support than the one found in Nexus devices. The video player is now perfectly usable out of the box - it plays a host of formats, which include H.263, H.264, MPEG4, VC-1, and VP8. You can also wirelessly sharing videos with a Wi-Fi enabled TV. The feature relies on DLNA technology to connect and the Miracast protocol for streaming. It's another feature most customs launchers had, but is only now making its way to the platform itself. Google Play Music is the default music player. It features Listen Now feature, which tries to determine what you like and the sequence of your track-changing so that it can start offering you music you might like to play next. Google Play Music also gives you the option to upload music onto the Google-branded cloud and stream it on your device via Wi-Fi or mobile data. There's also the nifty option of downloading the content onto the device if you want to have there for connection-less times. From the Settings key you can get into the equalizer. It can be turned on and off and features several equalizer presets along with a custom user defined one. If you plug in a headset, you can also play around with the Bass boost and 3D effect sliders. The Motorola Moto X (2014) did pretty well in our audio quality test, even if it didn’t quite break any records. The first part of the test (the one where it's connected to an active external amplifier) saw it improve on the scores of its predecessor and do excellently for the most part. The only two minor issues were the frequency response, which showed cut-off at extreme bass frequencies and the above average intermodulation distortion. 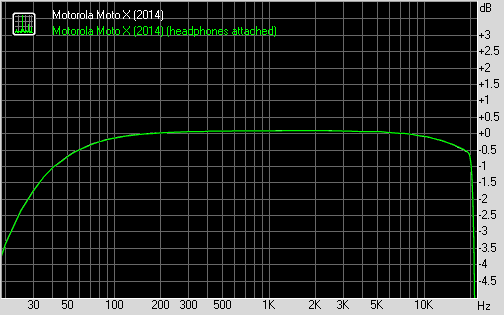 Plug in a pair of headphones and the Motorola Moto X (2014) shows a rather big increase in its stereo crosstalk but no other notable degradation. Just above average volume levels in both tests round up what is not quite perfect but certainly solid overall performance.